Italy is a country known for it’s sumptuous fare, and a charming restaurant may be just the right atmosphere for your wedding. Wonders of architectural beauty, Italian Lakes hotel venues and restaurants offer a perfect setting for memorable and unforgettable wedding receptions in Italy. 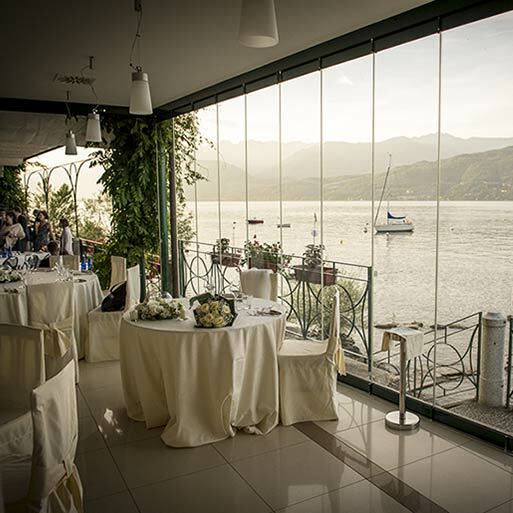 Panoramic restaurants overlooking the lake, Michelin starred restaurants, countryside restaurants with a rustic feeling or even informal yet romantic venues can host your Italian wedding party. 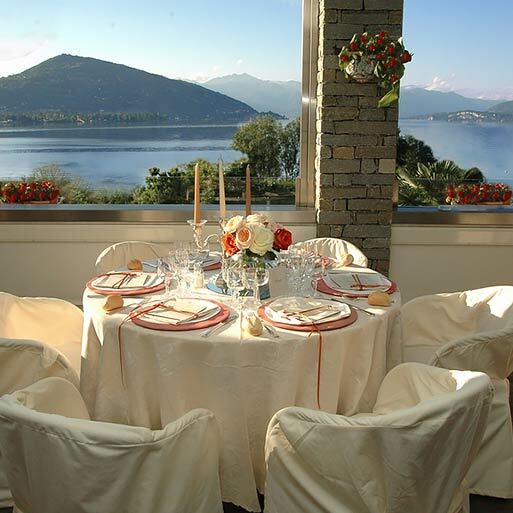 Find out more about best Wedding Hotels and Restaurants in the Italian Lakes Region by clicking on either their info page using the links below. A very romantic lake, discreet and full of history with the mysterious and fairytale island of San Giulio welcoming the Hotel San Rocco onto its shores. Surrounded by the ancient walls of a monastery, the Hotel San Rocco is a very special and friendly place. 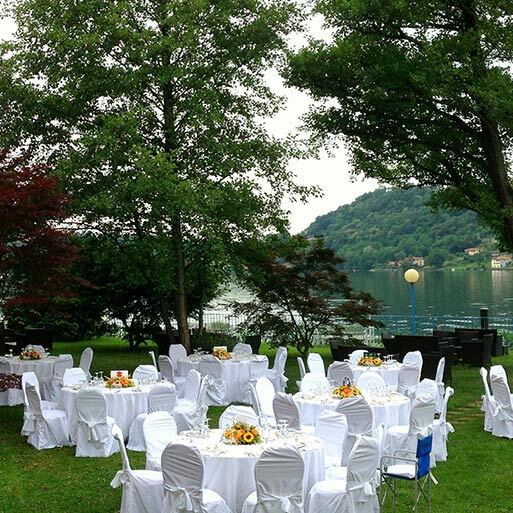 The San Rocco Hotel is the ideal place to hold successful events and weddings on Lake Orta. 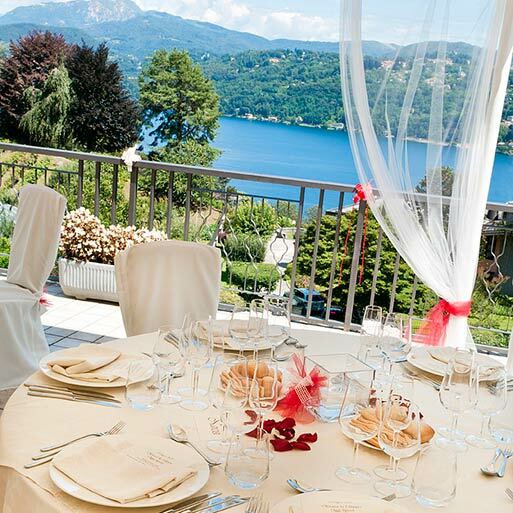 A beautiful view of Lake Orta and a wonderful and well-kept garden are the perfect backdrop to the restaurant La Tavernella, beautiful location where you can celebrate the most important day of life, in a unique and unrepeatable location. The Tavernella is located in Nonio, on the western shore of Lake Orta. 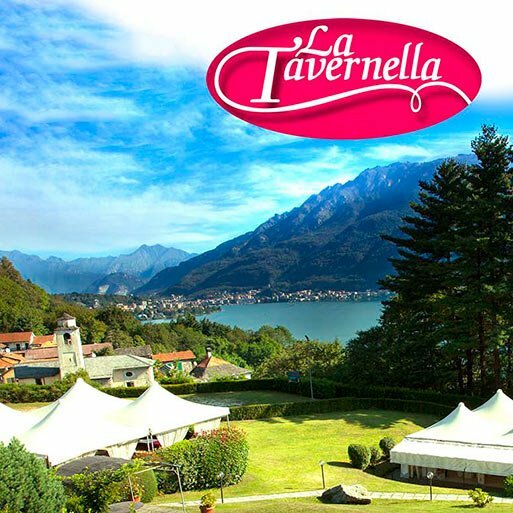 La Tavernella offers spacious and elegant spaces where to set up a magnificent wedding banquet. A restaurant by the shores in the enchanting Ortello gulf, L'Ustaria Ca dal Rat is a unique venue on Lake Orta, a magic timeless place that can make your wedding day unforgettable. Ustaria Ca dal Rat has also a private pier. A great solution to reach the venue after a ceremony in Orta and a lovely boat tour on the lake. LE BETULLE is a Hotel Restaurant located on wonderful Lake Orta close by San Maurizio d'Opaglio village. The venue has wide and elegant spaces that could be ideal for a detailed and fine wedding reception. 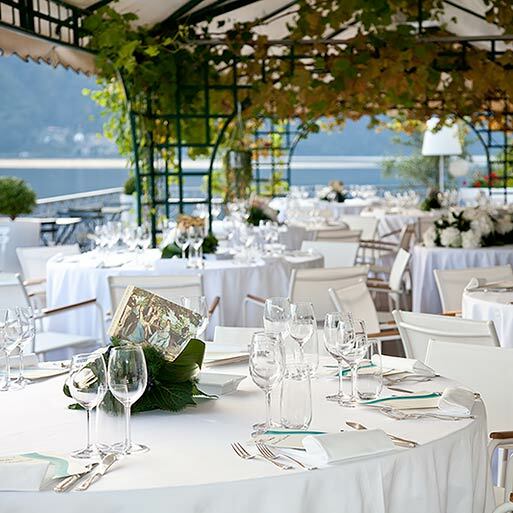 Great cuisine and lovely arrangement make it a wonderful option for your wedding on Lake Orta. The unbeatable lakeshore position makes the Hotel L'Approdo an ideal venue for weddings, receptions, functions, and wedding anniversaries, special occasions that require an eye for detail, and the care and professional attention that only years of experience can assure you. Hotel Belvedere is the perfect place for a couple who is looking for an elegant and romantic wedding day. The restaurant is located on the Fisherman’s Island and its character will make your reception unique and charming. You will spend a wonderful day by the shore of Lake Maggiore, surrounded by spectacular landscapes and by the friendliness of our staff. Relatives and friends await the bride and groom underneath the large white gazebo. An aperitif served on the lawn, the tables set in a blaze of flowers and colours. And finally the cake, which always manages to astonish. Giardinetto Hotel and Restaurant, the best choice for an unforgettable wedding. For your best day the Wellness & Beauty Hotel Conca Azzurra is the ideal place to make your dreams come truth. An evocative location with the bloomed park and the swimming pool, the restaurant on the panoramic Terrace with a spectacular view on the Lake Maggiore and the splendid chain of the Zeda mountain. 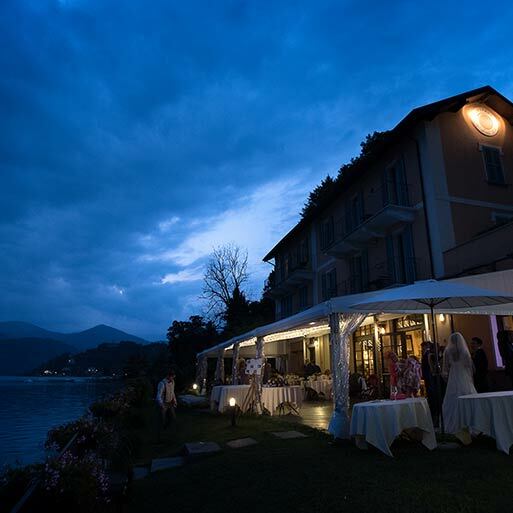 LUCI SUL LAGO is the new dreamy wedding venue on Lake Orta. 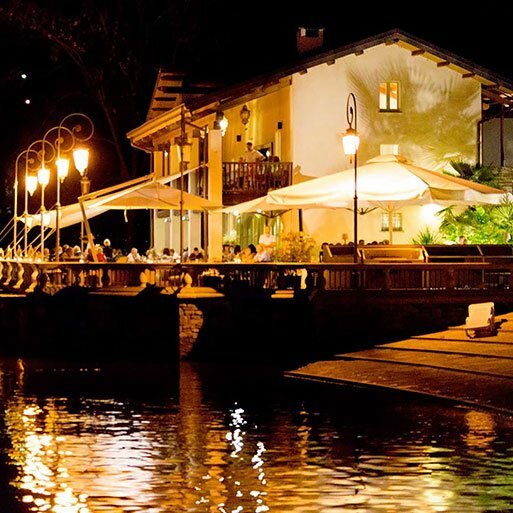 A restaurant by the lake shores facing Bagnera Gulf where you and your guests will spend unforgettable moments! LUCI SUL LAGO is the ideal venue for an outdoor reception by the shores under the white drapes in Morocco suk style.